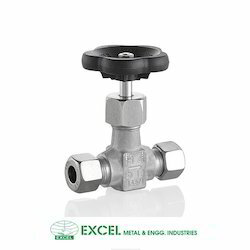 Needle valves are small valves used for flow control in liquid or gas services. The fine threading of the stem and the large seat area allow for precise resistance to flow. 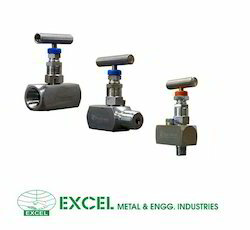 Needle valves are widely used for severe service operation as regulating and shut - off valves in many critical high pressure as well as vacuum application on fluid line connections like Natural gas lines,Gas sampling lines Test benches,Control panels,Instrument Air lines Hydraulic power systems Flow meters,manifolds Drain,Vents, Pressure gauges and Transmitters Etc. 1. Pressure up to 6000psi (412)bar. 2. Temperature from 70T (21"C) to 450T / 232 0 C / with standard TFE packing and up to 1200 0 F with optional Grafoil packing. 3. Orifice size of 0.156" (3.962) to 0.437" (11.0998). 4. Choice of soft seat,V and ball Tip stem design. 5. Straight and angle pattern. 6. Many combinations of end connections. Size 1/2 " to 2 "
We are introducing an outstanding gamut of Carbon Steel Needle Valves at market leading prices. These are manufactured using supreme quality basic material and progressive technology as per international standards at vendors’ end. Furthermore, these offered products can be availed in different specifications as per the requirement of the client. Our offered products are highly appreciated, attributable to their remarkable features. 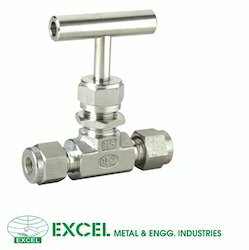 Features: Optimum performance Easy to fit Rust free Specifications: Material Size End Connection Pressure Class Specification Manufacturer Stainless Steel ¼” to 8” Screwed [NPT] Class 150 ASTM 1. Audco Carbon Steel Socket Weld Class 300 BS 2. Leader Alloy Steel Flanged End Class 600 DIN 3. BHEL Gun Metal Screwed Parallel Class 800 ASA 4. Spirax Brass§ Bronze Screwed Taper Class 1500 SIS 5. Klinger Forge - Class 2500 - 6. Lender Cast Iron - 7. NETA Cast Steel 8. Hammer Mild Steel 9. Spirax Marshall Etc. Needle Valve as per parker make - availabe in SS 304 , SS 316 & Brass. Size form - 1/4" to 3". Our organization is engaged in offering a comprehensive range of H.P. 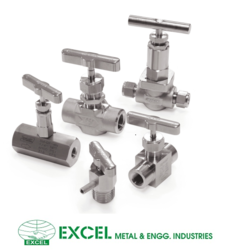 Series Needle Valves. These are developed after extensive research to deliver defect free range of special purpose severe service valves. Further, the steam threads rolled and hard plated and tip stellited prevent galling and extends the working life. Maximum Working Pressure: 10,000 PSI (400 bar) at 200oC. 20,000 PSI (700 bar) at 1200 C.
Vee tip design - Controls accurate flow. Stem threads Rolled & Hard Plated - Provides additional strength & maximum service life. Size 1/2 " - 2 "
Our Company is offering a wide assortment of SS Needle Valve. These products are highly demanded due to high strength. We are also looking forward for a distributer from any of countries for our products , if any client is interested we can visit and complete the deal. We are involved in manufacturing and supply of international quality standard needle valves (OD). For fabricating these valves, we use top grade material, which is procured by us from the reliable sources. These high performance needle valves can be availed from us according to clients'' specifications and demands. we are betrothed in providing a wide series of Double Ferrule Needle Valve. 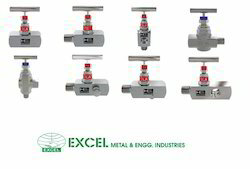 We are an affluent manufacturer, exporter and supplier of a wide range of Needle Valve.The offered valves are widely used in gas sampling & high pressure instrument lines, refineries pilot plants. Our offered valves are manufactured by our qualified professionals using superior quality raw material and leading edge technology as per the set industry standards. Apart from this, our offered valves can be availed by our clients at affordable prices.